Has reduced cost, and the shield is strengthened further for each enemy hit. No longer deals damage to enemies on activation, instead deals damage when shield expires based on the amount it absorbed. Sun Shield: Surround yourself with solar rays, granting a damage shield equal to [27 / 28 / 29 / 30]% of your Max Health for 6 seconds. Nearby enemies take [1848 / 1868 / 1889 / 1908] Magic Damage when the shield is activated, and each enemy hit increases the shield's strength by 4%. Radiant Ward: Cost: 3980 Magicka. Blazing Shield: Surround yourself with solar rays, granting a damage shield equal to 30% of your Max Health for 6 seconds. Each nearby enemy increases the shield's strength by 4% when the shield is activated. When the shield expires it explodes outward, dealing [21 / 24 / 27 / 30]% of the damage it absorbed to nearby enemies. Sun Shield applies a Damage Shield to you. Enemies nearby take Magic Damage on cast, and increase the shield's magnitude. The Radiant Ward morph reduces the casting cost and further strengthens the shield based on the number of enemies affected, while the Blazing Shield deals damage to all enemies at the end of the effect based on how much damage it absorbed, rather than a fixed amount at the beginning. Be careful when using the Blazing Shield morph that you don't re-cast it until the ending blast has occurred, otherwise you will cancel the original blast and the spell ends up doing basically nothing except for an expensive and fairly minor Damage Shield. By contrast, due to its reduced cost, the Radiant Ward morph can effectively be used several times in rapid succession to quickly take out some weaker mobs of enemies. The Damage Shield from the first cast still persists for the full duration, so even if there are fewer enemies on successive casts, your shield won't be reduced (except by the normal means of taking damage). 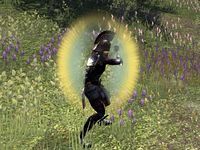 Blazing Shield is a recommended morph for the Templar Initiate build. This ability no longer stops your magicka regeneration. Increased the cost of this ability by 10%. Radiant Ward: In addition to increased shield strength, this morph also has a reduced cost. Radiant Ward: Increased the shield strength bonus from this morph's shield to 6% per enemy hit from 5%. Blazing Shield: Fixed an issue where this morph was not working with the Spear Wall and Piercing Spear passive abilities. Blazing Shield: Reduced the amount of damage done by this morph to 33/36/39/42% of the damage absorbed by the shield, down from 50/51/52/53%. Blazing Shield: Fixed an issue where casting this morph would aggro neutral monsters around you.